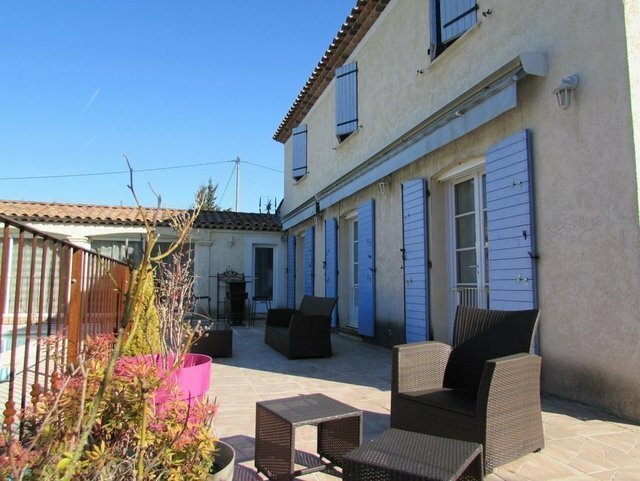 Provencal style villa in a quiet area of Mougins and walking distance from shops and close to the highway. Large entrance opening onto a double lounge, fitted and independent kitchen, a storage room, a bedroom, a large office which can be used as a bedroom with a shower-room. On the first floor we have 4 bedrooms that share a bathroom, a master en-suite bedroom with dressing room and bathroom. The garden is flat and the pool is in the center. We can discover a beautiful course giving access to a carport for 2 cars.